WASHINGTON (AP) — Vivid greens and whites chosen to evoke the coming of spring will welcome Canadian Prime Minister Justin Trudeau to a White House state dinner in his honor Thursday, the first one in nearly 20 years to celebrate U.S.-Canada relations. Canadian whiskey is on the menu. But just a drizzle. Trudeau comes bearing one of the most famous names in Canadian political history. He's been in office for less than six months and his first official U.S. visit will be closely watched here and at home. His late father, Pierre Trudeau, was prime minister for the better part of 16 years, starting in 1968, and remains the rare Canadian politician who is recognized in America. Rows of blooming orchids, hydrangeas and amaranth in shades of green and white will decorate the main floor of the White House, as well as the East Room where some 200 guests will sit down for the meal. Green is a favorite color of Trudeau's wife, Sophie Gregoire, who is accompanying him. "It kind of gives you a feeling of walking through a garden in springtime when all the flowers are starting to bloom," Hedieh Ghaffarian, the White House's chief floral designer, said Wednesday at a media preview of the dinner. Dinner will be served on the Obama state china service, which is trimmed in a shade of blue and was unveiled just last year. A baked Alaskan halibut casserole garnished with spring vegetables will be served in a tureen for the first course, and be followed by a pungent salad of roasted apricots in ginger, cardamom and White House honey and sitting on a bed of greens. The main course of herb-crusted Colorado lamb will be livened up by a splash of Canadian whiskey just before the guests dig in. Not since April 1997, when then-President Bill Clinton hosted Jean Chretien, have an American president and Canadian prime minister clinked champagne flutes at the White House. Thursday's dinner is also the 10th state dinner under Obama, and the first one during his final year in office. Toasted Texas pecans and New England maple syrup will be highlighted in the dessert cake. 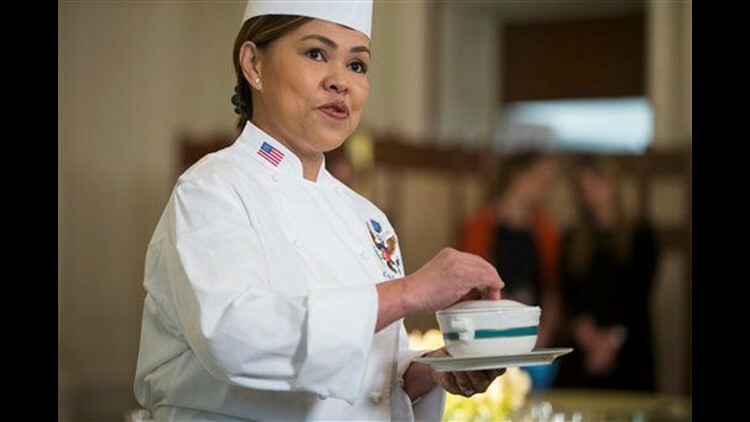 While Canada is known for its maple syrup, White House executive pastry chef Susie Morrison said product from New England is what the kitchen had on hand. Guests will also choose from an assortment of petite pastries with American and Canadian influences as part of a hand-crafted sugar sculpture that was inspired by the Rocky Mountains, a range that extends some 3,000 miles between New Mexico and Canada. Sara Bareilles, a favorite of Mrs. Obama and known for her hit, "Love Song," is headlining the after-dinner entertainment. The glitzy dinner will mark the end of a day for Trudeau that begins with a pomp-filled arrival ceremony on the South Lawn and will provide him with plenty of time in private talks and in front of cameras with Obama, who remains a popular figure in Canada. After standing alongside Obama at a news conference, Trudeau will head to the State Department for a lunch hosted by Secretary of State John Kerry before he returns to the White House for the dinner program.